Our model (PERSOC) combines and generalizes two broad and influential ideas, componential models like the social relations model (SRM; Kenny, 1994; Kenny & La Voie, 1984) and process models like the lens model (Brunswik, 1995, Funder, 1999). It specifies the types of variables that need to be considered and describes the processes that combine these variables and together characterize the dynamic interplay of personality and social relationships. 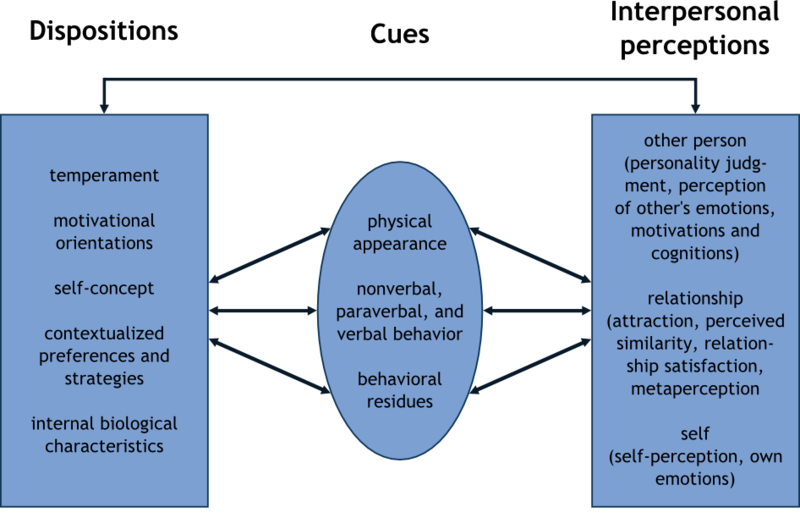 Figure 1: Main Variables for Analyzing Personality and Social Relationships. Second, PERSOC acknowledges that behaviors (e.g., smiling, helping, flirting) as well as interpersonal perceptions (e.g., relationship satisfaction, extraversion judgment, perceived attractiveness) in a real-life context are necessarily componential. Behaviors and perceptions consist of general tendencies of actors/perceivers, general tendencies of partners/targets as well as of specifically relational actions/perceptions. Imagine Person A judges the attractiveness of Person B. This judgment is affected by a stable tendency of A to judge other peoples attractiveness (A’s perceiver effect), by how attractive B is commonly judged by others (B’s target effect) and the idiosyncratic effect of how A judges B (relationship effect). A similar characteristic applies for a behavioral interaction between A and B, such as helping behavior. 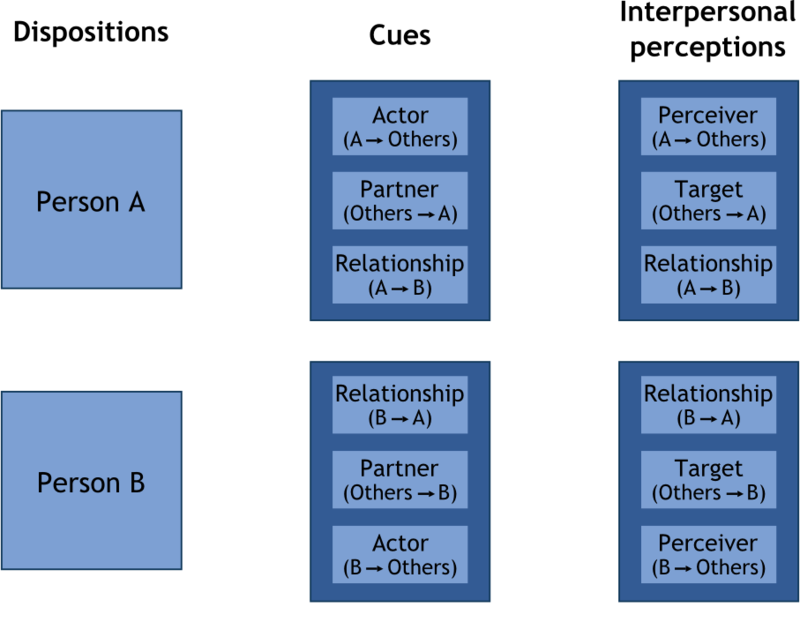 A shows a stable tendency to help others (A’s actor effect), B shows a consistent characteristic of people helping him (B’s partner effect), and again there is a distinctive effect of A helping B (relationship effect). The same logic applies to any kind of perceptional or behavioral measure. For a given interaction of Person A and Person B, each cue (e.g. A behaves aggressive towards B) can be decomposed into an actor effect (e.g., how aggressive A generally behaves towards others), a partner effect (e.g., how aggressive others generally behave towards B), and a relationship effect (e.g., how much A uniquely behaves aggressive towards B). Analogously, each interpersonal perception (e.g., B does not like A) can be decomposed into a perceiver effect (e.g., how much B generally dislikes others), a target effect (e.g., how much A is generally disliked by others), and a relationship effect (e.g., how much B uniquely dislikes A). Additionally diverse dispositions of A and B might come into play. 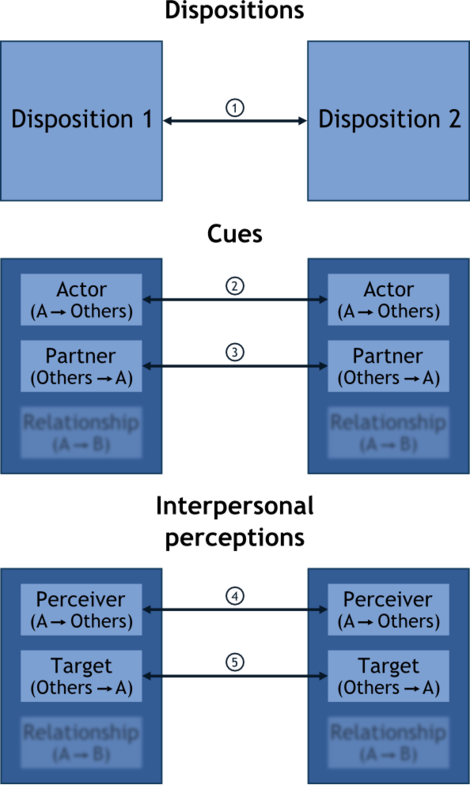 For each interaction partner of a dyad there exist individual dispositions, an actor, a partner, and a relationship effect for each cue and a perceiver, a target, and a relationship effect for each interpersonal perception. 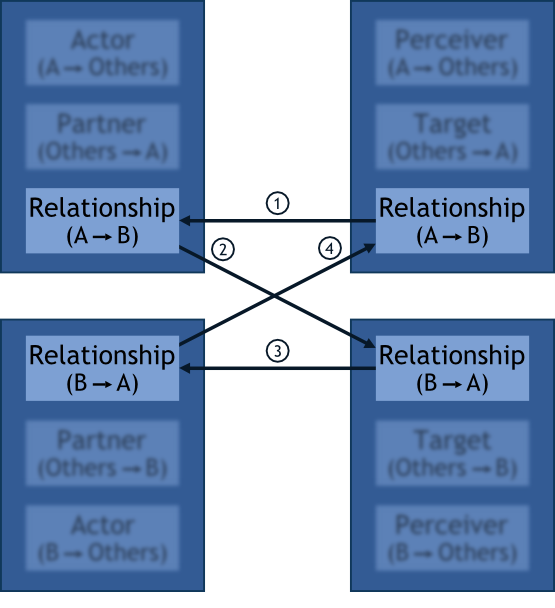 Whereas actor/perceiver effects and partner/target effects are individual variables (they characterize individuals across different interaction partners) relationship effects are dyadic variables (there are 2 unique relationship effects for each dyad). By considering the interrelations of these variables the processes that regulate the interplay of personality and social relationships can be described and analyzed both on an individual and a dyadic level. Figure 3: Individual processes within types of variables. Different dispositions are more or less conceptually related to each other (1). For example narcissism is positively related to extraversion and negatively related to agreeableness, implicit neuroticism is only moderately related to explicit neuroticism. With respect to cues, actor and partner effects of one variable (e.g., smiling) can influence actor and partner effects of another variable (e.g. talking). People who smile a lot towards others (high actor effect smiling) might automatically tend to talk a lot with others (high actor effect talking) (2). On the other hand, people who evoke lots of smiles by others (high partner effect smiling) might also lead others to talk a lot with them (high partner effect talking) (3). The same applies to interpersonal perceptions: Perceiver and target effects of one variable (e.g., perceived similarity) can be related to perceiver and target effects of another variable (e.g., liking). People who generally tend to perceive others as similar (high perceiver effect perceived similarity) might also be likers (high perceiver effect liking) (4) and being generally seen as similar (high target effect perceived similarity) might be closely related to being popular (high target effect liking) (5). Figure 4: Individual processes across types of variables. Dispositions influence the way people generally behave towards others (1). For example highly neurotic persons might generally tend to show more ambiguous communication patterns in romantic relationships (actor effect ambiguous communication). Dispositions also influence general perceptions of others (2). Neuroticism might also be related to being generally dissatisfied, including a low satisfaction in romantic relationships (perceiver effect relationship satisfaction). Chronic interpersonal perceptions also influence general behaviors towards others (3). General dissatisfaction with romantic relationships (perceiver effect relationship satisfaction) might contribute to an ambiguous communication style (actor effect ambiguous communication). Behavioral habits influence the way people are generally perceived by others (4). Because of the dysfunctional communication style (actor effect ambiguous communication) others might be themselves generally dissatisfied with the romantic relationship (target effect relationship satisfaction). Being perceived in a certain way is related to others generally behaving in a certain way with oneself (5). If others are generally dissatisfied with the romantic relationship with a certain partner (target effect relationship satisfaction), this partner might generally evoke ambiguous communication patterns (partner effect ambiguous communication). Generally evoking certain reactions from others leads to general perceiving others in a certain way (6). Being exposed to general ambiguous communication patterns of others (partner effect ambiguous communication) might reinforce the negative perceptions of people high in neuroticism (perceiver effect relationship satisfaction). These six kinds of individual processes can include all kind of dispositions, cues and interpersonal perceptions and apply to all types of social relationships (e.g., first encounters, short-term acquaintances, group members, friends, family relationships, romantic relationships). Both, individual processes within and across variables can of course be combined to understand the interplay of various dispositions (e.g., agreeableness, extraversion), cues (e.g., smiling, asking for help), and interpersonal perceptions (e.g., perceived friendliness, trust) on the individual level. Our framework comprises a multitude of processes that make up this dynamic interplay. Extraversion and agreeableness might for example jointly influence the general tendency to smile (actor effect smiling), to regard others as friendly (perceiver effect perceived friendliness) and to trust others (perceiver effect trust), which also predicts smiling tendencies (actor effect smiling). Being a smiler in turn might lead others to regard oneself as friendly (target effect perceived friendliness), which leads others to trust oneself (target effect trust). Because of these reputations others might tend to ask oneself more often for help (partner effect asking for help) and to smile more at oneself (partner effect smiling), which reinforces the positive outlook on others (perceiver effects perceived friendliness and trust) leading to actually stronger general helping behavior towards others (actor effect helping), and so forth. The first relevant processual question on the dyadic level is: How can unique relational perceptions and actions evolve? According to our model interpersonal perception relationship effects are the result of an interaction of the perceiver’s dispositions and the partner’s cues. Depending on the perceiver’s dispositions, the general behavior or physical appearance of another person is specifically processed leading to a unique interpersonal perception. Unique perceptions in turn lead to unique actions. 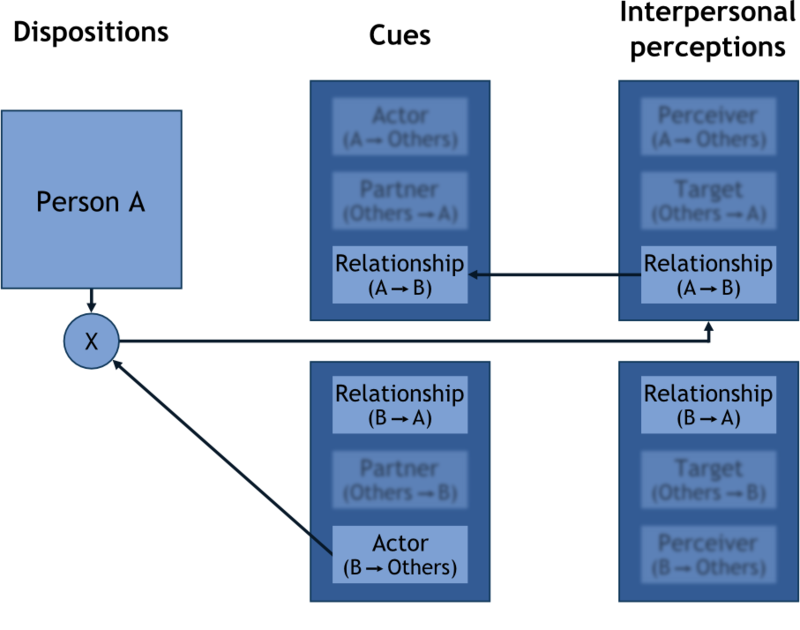 Figure 5: The origin of relationship effects. A shy person might for example specifically perceive another person with a loud voice as threatening (relationship effect perceived threat) which then leads to uniquely avoiding this person (relationship effect avoidance behavior). Structurally similar processes are hypothesized by social-cognitive models of personality which explain the effect of person-situation interactions on behavior via the personality-dependent processing of situational information. These dynamics might also be used to explain the effects of dispositional similarities (e.g., extraversion similarity) on unique perceptions. People similar in extraversion might uniquely like each other because they both dress in a stylish way (actor effect clothing) and both specifically process this information positively, leading to uniquely positive perceptions. Once there are unique relational perceptions, a variety of dyadic processes within and across types of variables can be activated. Figure 6: Dyadic processes within types of variables. Relationship effects of one cue (e.g. laughing) might be directly related to relationship effects of another cue (e.g., self-disclosure). Uniquely laughing at a specific other person (relationship effect laughing) might be related to uniquely disclosing personal information towards this person (relationship effect self-disclosure) (1). 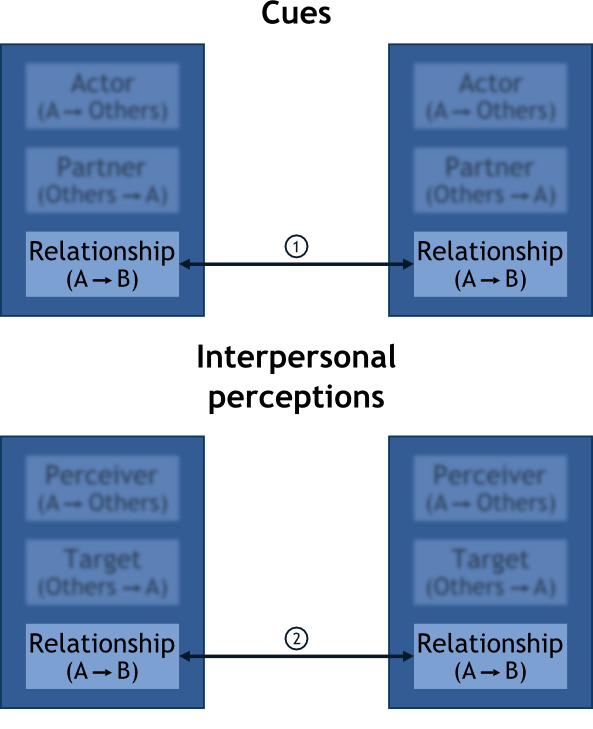 Similarly, relationship effects of one interpersonal perception (e.g., perceived intelligence) might lead to relationship effects of another interpersonal perception (e.g., perceived utility). If one for example uniquely perceive another person as intelligent (relationship effect perceived intelligence) one might get the unique impression of this person as being very helpful for achieving one’s goals (relationship effect perceived utility) (2). Dyadic processes also relate relationship effects across types of variables. As described and shown above unique interpersonal perceptions evolve if cues are perceived differently depending on the perceiver's dispositions. For example people with a low tolerance for uncertainty might specifically process persons who constantly avoid eye contact with others (low actor effect seeking eye contact). This could result in uniquely feeling tensed (relationship effect tenseness). Figure 7: Dyadic processes across types of variables. Unique interpersonal perceptions lead to unique actions (1). If Person A for example feels uniquely tensed in the presence of Person B (relationship effect tenseness A-B), this might lead to Person A uniquely avoiding eye contact with Person B (relationship effect seeking eye contact A-B). Behaving in a unique way in turn makes the other person uniquely perceiving oneself (2). Uniquely avoiding eye contact with B (relationship effect seeking eye contact A-B) might make B being uniquely tensed (relationship effect tenseness B-A). Unique perceptions of the other person then also lead to unique actions of that person (3). B getting uniquely tensed (relationship effect tenseness B-A) might now also uniquely avoid eye contact with A (relationship effect seeking eye contact B-A). These reciprocated unique actions impact the original unique perceptions (4). As B now uniquely avoids eye contact with A (relationship effect seeking eye contact B-A), A’s unique tenseness (relationship effect tenseness A-B) is getting reinforced. Our framework provides a common language for analyzing a number of different Research Questions for diverse social relationships such as first encounters, short-term acquaintances, friendships, romantic relationships and family relationships. We hope that PERSOC will help to foster integrative research on personality and social relationships. It could moreover be helpful for defining personality as well as social relationships, for clarifying the processes involved in the interplay of personality and social relationships, for detecting underestablished research domains, and for specifying adequate research designs and analyses. Check out Research Questions and our Teaching Materials for more informations about our model and possible applications.